Cricketing nations have a very good idea what a boundary is, it’s good for a cool four runs, without the bother of running! Corners are tense moments in a football (soccer to some) match when a well struck ball can curve into the goal. The crease is what a batsman lunges for when the wicket keeper ….. wait! this is not a sports column, but CQG+! Let’s back up and explain what our paper really is about. In a path integral approach to quantum gravity, one has to divide up spacetime into pieces and focus on the action within each piece. In the elementary case of particle mechanics, this “skeletonisation” converts the action expressed as a Riemann integral into a discrete sum. A desirable property of the action is that it should be additive when we glue the pieces back together. This is achieved only when one properly takes into account the boundaries of the pieces. The boundaries can be spacelike, timelike or null. Much work has focused on the first two cases. The Einstein–Hilbert Action principle for spacetime regions with null boundaries has only recently attracted attention (look up the Arxiv for papers by E. Poisson et al and Parattu et al; references would not be consistent with the chatty, informal style of CQG+). These papers deal with the appropriate boundary terms that appear in all boundary signatures. Our paper (authors: Ian Jubb, Joseph Samuel, Rafael Sorkin and Sumati Surya) gives a unified approach to all boundary signatures using Cartan’s tetrad formalism. An unexpected feature of the boundary term required here is that it is not gauge invariant under local Lorentz transformations (although its variation is). As the tetrad formalism may not be familiar to some readers of CQG, we also give a treatment in terms of metrics. When the boundary has corners the action has to also contain corner terms. Cartan’s tetrad formalism gives a simple way to arrive at the corner terms, exploiting the gauge non invariance of the boundary terms. Spacetime boundaries can be null. A classic example is the region exterior to a black hole, whose boundary is a frozen wavefront, the event horizon. Horizons can have creases where the null normal is discontinuous, as happens when new null generators enter (or leave) the horizon. Another example of a null boundary is that which appears in a Causal diamond. A causal diamond is the intersection of a past set with a future set and looks (when it is drawn on a blackboard) much like the diamond in a baseball game. Yet another example of a null boundary is Scri, asymptotic null infinity. Null boundaries deserve special attention since their normals are also their tangents. Our unified treatment paints all kinds of boundaries with the same brush. A photograph taken on the terrace of the library building during the workshop around December 2015. 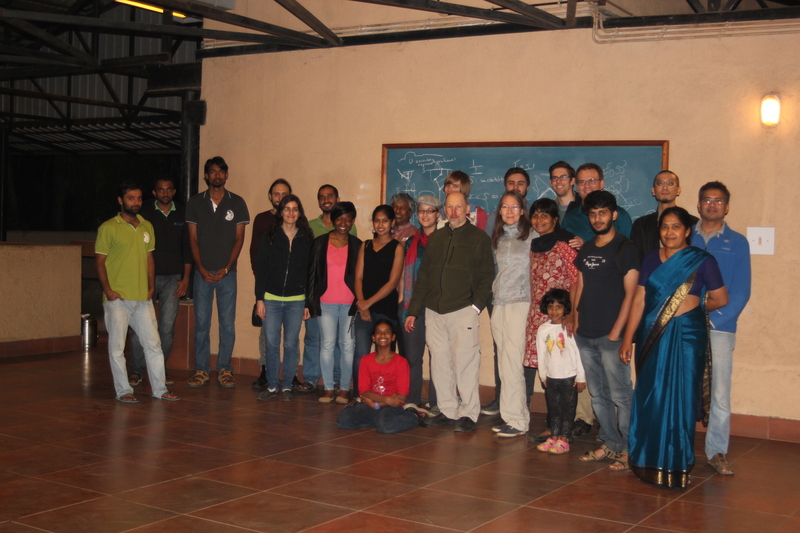 This work, involving a collaboration across continents had its genesis in a series of workshops organised at the Raman Research Institute in the last few years by Sumati Surya. Come December, when the skies are grey in the northern latitudes, some of our colleagues, like migrating birds, wing their way south, to the Raman Research Institue (RRI) in Bangalore, India. The photo above shows some of them with friends and families. Visible in the photograph are the four authors of our paper. The photograph is taken on the terrace of the library building, where the talks took place. The talks and discussions revolve around general relativity (mostly from the Causet point of view championed by Sorkin), Quantum Measure theory, entanglement entropy, the cosmological constant and topology change. Sometime in December 2014, the discussions around the meeting raised the question of null boundaries. This question was partly answered and then revived at the subsequent meetings and culminated in the paper. Do take a look at it. A few words about the RRI campus may be in order here: it is wooded and distinctly cooler than the surrounding areas because of the foliage. The trees are home to a variety of bird, animal and insect life. Common birds are sunbirds, bulbuls, koels and barbets, whose calls you can listen to as a welcome distraction from work. There is a dwindling population of slender lorises and a thriving population of lazy cats. During November / December / January the skies are clear blue (though dotted with soaring kites) and the wooded campus attracts a seasonal feathered visitor, the paradise flycatcher. Each year these birds stop at the Institute campus for about two weeks before going further south to their destination in the Nilgiri hills. What attracts the birds here is probably the insect life, which is also pretty diverse (Arachnophobes are advised to desist from clicking on this link.). The Raman Institute has groups doing research in four select areas of physics: Astrophysics, Theoretical Physics, Soft Condensed Matter and Light and Matter Physics. There is also research in chemistry and a substantial thrust in instrumentation related to Astronomical Observations at telescopes in India and around the world. For more information on this look at Facebook or Twitter. The theoretical physics group has interest mainly in General Relativity and Non equilibrium Statistical Physics. Apart from the permanent faculty at RRI, we have postdocs, PhD students and a vibrant Visiting Student program at the Bachelor’s and Master’s level. We also have an outreach programme to interface with schools and colleges. Check out our homepage for more details. About the Author: I am a theoretical physicist at the Raman Research Institute. My interests include general relativity, optics, the geometric phase in quantum mechanics, DNA elasticity and science popularisation. I keep moderately fit by raising and lowering indices. I enjoy gardening and relax by cooking exquisitely textured lacy appams for my friends. This entry was posted in Author Insights, IOPselect and tagged quantum gravity, spacetime by David Jones. Bookmark the permalink.